BIM can seem complicated at times, but is it really? Certainly BIM processes and procedures can end up being complicated, just try and and understand some of the standards that are being pushed.If only there was a way to cut through the guff, to have a simple set of principles that could be applied in any situation where BIM is at issue.Like in Mathematics. Mathematics is all about logic, but that logic has to be based on something, has to start somewhere. This is where Axioms come in. An Axiom is “a self-evident truth that requires no proof“. Maybe that is a step too far for BIM. But what about a “universally accepted principle or rule“. First we need to be clear about what we are talking about, what we mean by BIM. I wrote a post about this back in 2012 – What Does BIM Mean to You? Hopefully by now we are beyond arguing about personal interpretations. Also back then discussion was more centered on buildings and the particular form of model used. BIM has moved on since then so I think a more universal definition is warranted. BIM is a generic term for anything that involves software that directly associates data with geometric information. The term BIM is used to describe the thing – the Building Information Model, the process – Building Information Modelling and management – Building Information Management. Usually BIM applies to buildings, or facilities, but may be applied to other things like infrastructure and GIS (Geographical Information System). Really anything in the built environment that has a physical form and meaningful data. So now we are on the same page what are the essential axioms we can use to apply to BIM topics and issues. 1. BIM can be used by anyone for anything. BIM is not limited to certain purposes or particular groups. BIM is not just for design, construction or operation. It is not just for design analysis, clash detection, facilities management. Nor is is just for buildings, infrastructure or GIS. The data in BIM models is agnostic, it doesn’t care who uses it or for what purpose. It can be used to educate, to inform, in contracts, to create VR, for disaster planning, even preparing terrorist attacks (hence the need for PAS1192-5). Allied with this is there is no theoretical limit to the type of data. If there is data that you would find useful you can add it (or pay someone to add it). Just don’t expect someone else to do it for free – see Axiom 2. 2. The BIM you do directly benefits what you do. If not, you are doing someone else’s work for them. The reason you use BIM software and processes is to improve the efficiency and quality of the work you do and are responsible for. If you don’t think you are, apply Axiom 1 – BIM can be used for anything, and work out how it could benefit what you do. This Axiom is not just about personal gain. This is an important aspect of BIM. Processes where each participant is benefiting will always be more robust, have greater take up, and longevity. But more importantly it is critical participants only work within their area of expertise and responsibility. Architect’s should not use BIM to do structural analysis. Design professionals and contractors should not be responsible for providing data that is specifically structured for FM purposes. Providing data to others is fine, but providing data that is fit for someone else’s purpose is a step too far. And unnecessary. Structured data is accessible no matter how it is structured. Standards may help if those standards are adequate, but lack of standards does not make it an impossible task. So if you find yourself in a situation where what you are doing is of no benefit to what you do, you are within your rights to say no, – we don’t do that, or demand to be paid to do it. Conversely, if you are doing it for your own purposes and someone else is benefiting from it, you give them free access to it, after all it is not costing you anything. 3. BIM replaces or enhances something you already do. BIM is something you do instead of other less efficient and less accurate methods. If you are following Axiom 2 – you are using BIM for your own benefit, you will be using it to do things you were already responsible for. You don’t draw in Autocad AND model in ArchiCAD, you don’t manually create a schedule in Excel AND create the schedule in Revit. You don’t do a structural design by linking an analysis package to your model AND calculate it all out with pen, paper and calculator. You don’t use a BIM model and a total station to set out ceiling hangers AND measure them out with a measuring tape. You don’t have a room full of drawings & folders AND have an integrated FM database. This also applies to management. There may be a new position called BIM Manager, but it isn’t a new profession. It’s a manager who uses BIM to do the things managers do already. BIM is a tool to get things done. It is not a thing in itself. If you are doing BIM for no measurable purpose you are wasting your time. 4. BIM is not possible without BIM capable software. BIM is fundamentally a technology of a particular type of computer software. BIM capable software is software that, as a minimum, can store and manipulate geometric information and associate data to that geometry. Software that only does geometry (CAD, SketchUp, Rhino, etc) or just manages data (databases, spreadsheets, etc) are not BIM capable. BIM is often described as a process, but it is a process of managing BIM capable software. It may involve only managing the output and exchange of that software, but to do that effectively you need an understanding of the abilities and limitations of the software involved. BIM Management ignorant of software issues is nothing more than management by wishful thinking. There are some who think mandating “OpenBIM” means software becomes irrelevant. OpenBIM may be developed by committees with high ideals, but it is still software (or software format), it still has a fixed form that people have to try and use to get things done. BIM softwares that are used in the real world have to be able to interact with “OpenBIM” formats or BIM processes will not be possible. When it comes to BIM you always have to consider the impact of the softwares being used. 5. BIM works best with Collaboration. Sharing your data means others share their data with you. BIM works best if your combine it with collaboration with others, but you can still use BIM without any collaboration. An architect can use Revit to just create drawings and schedules but never give the model to anyone. The architect is still doing BIM, benefiting from it by being more efficient and accurate, even though there is no collaboration. If you think about it BIM can’t just be collaboration. 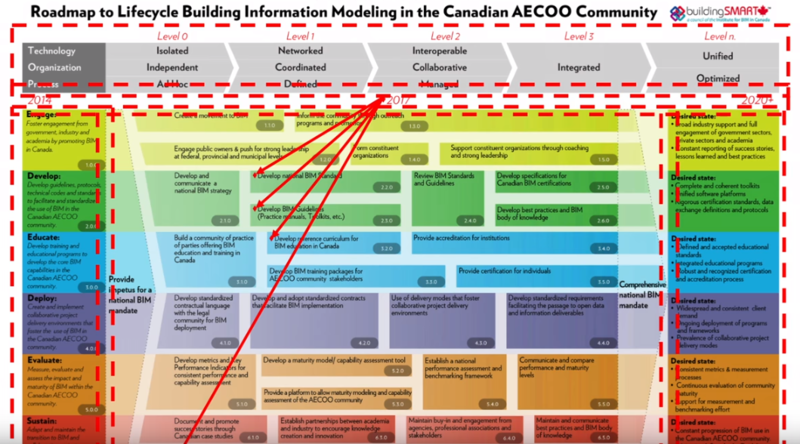 If none of the collaborators produce or can offer BIM, how can there be any collaboration? There is nothing to collaborate with. Collaboration is a secondary consideration. Establishing what BIM will be done (Axiom 1), that there is a benefit (Axiom 2), and that it is doing something that it is required because it is already being done (Axiom 3), has to be done first. But once that happens collaboration is definitely low hanging fruit. Consider the example above. If the architect share their model with, say, a quantity surveyor who uses the model to measure quantities, the architect will get costing advice much quicker and more often (as will the client), leading to the architect wasting less time on abortive work. Of course there are other considerations than just the Axioms when looking at BIM. Whether the effort or expense is worth the outcome. Whether it is possible with current technology and skill sets. Whether there enough time in the program for implementation. But these are not principles about BIM, they are problems to overcome. If it is not worth the effort, how could the effort be reduced, or the outcome enhanced to make it more valuable? If it is not currently possible when will it be possible, or what is possible now, what is practical now? Compare how much extra time is required against the benefits. Can the program be adjusted to allow more time upfront? So next time you are in a discussion about BIM keep in mind the BIM Axioms, they may provide a quick answer to a silly proposition. BIM can be used by anyone for anything. The BIM you do directly benefits what you do. BIM replaces or enhances something you already do. BIM is not possible without BIM capable software. BIM works best with collaboration. Have a go at this quiz to see how easy it is (answers below). A. You wouldn’t use BIM for that. B. It’s your job to give me the data I need. C. BIM is a whole lot of extra work. D. It doesn’t matter which software you use for BIM. E. We can’t use BIM because the contract doesn’t have collaboration clauses (is not IPD). A. You can do BIM with CAD software. B. It is extra work to get our schedules out of Revit. C. The primary purpose of BIM is for facility operations. D. We can’t use BIM because there is no BIM Execution Plan. E. COBie doesn’t cost anything.